The optional Standard Control Surface (SCS) allows to edit some (but not all) configuration values without the need of a computer. In addition a LCD is required. The recommended size is at least 2x20! Graphical LCDs (GLCDs) are supported as well. The MIDIO128 project uses the same control surface, which means that users who built a MIDIO128 can upload the MIDIbox NG firmware and control it with their existing hardware, and vice versa! 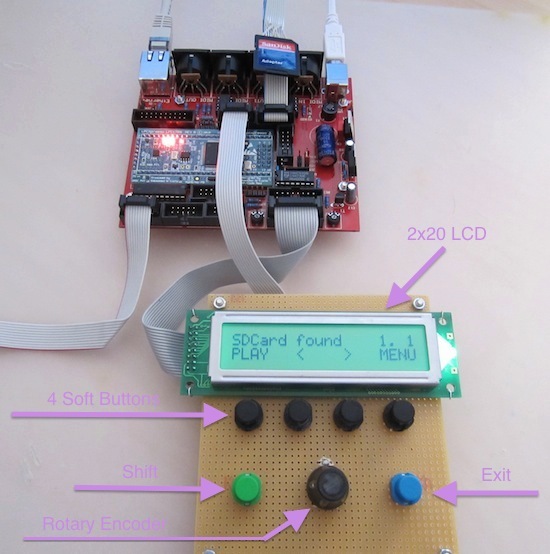 In the main page (which is active after power-on) it's possible to emulate BUTTON and ENC functions, which means that a very basic MIDI controller with a rotary encoder + 6 buttons could be created without the need to attach a MBHP_DIN module to the core! Alternatively, it's possible to access the SCS menu system from buttons/encoder which are connected to a MBHP_DIN module. In this case, Meta events have to be used to trigger the SCS functions. The events could be assigned to dedicated buttons/encoder, but also to controllers which are part of a bank (means: access the SCS by pressing your self-defined shift button which switches to a different bank). In the main page (which is active after power-on) the SCS menu system is inactive. Instead, MIDIbox NG will display the strings which are printed by the controllers as specified in the .NGC file. By pressing the EXIT button the menu system will be entered. Press it again to exit the menu system. The SOFT1..4 and SHIFT button, as well as the encoder have no effect in the main page by default, but they can emulate controller ids! EVENT_BUTTON id=2000  type=Meta   meta=SetBank   button_mode=OnOnly range=1:1  lcd_pos=1:17:1 label="Bnk%q"
EVENT_BUTTON id=2001  type=Meta   meta=SetBank   button_mode=OnOnly range=2:2  lcd_pos=1:17:1 label="Bnk%q"
EVENT_BUTTON id=2002  type=Meta   meta=SetBank   button_mode=OnOnly range=3:3  lcd_pos=1:17:1 label="Bnk%q"
EVENT_BUTTON id=2003  type=Meta   meta=SetBank   button_mode=OnOnly range=4:4  lcd_pos=1:17:1 label="Bnk%q"
Of course, the buttons/encoders could also trigger any other action which is controllable by an EVENT_* definition. E.g., they could also send MIDI events. In fact, MIDIbox NG configurations are thinkable which only only consist of these SCS components! The variables could also be used for other purposes of course, they are only placeholders for typical usecases. The Snapshot page allows to select, load, save and dump a snapshot. Snapshots are stored in a .NGS file with the same name of the .NGC configuration which is currently active. Up to 128 snapshots are available: 0..127; the stored values are referenced with the control element ids. It's allowed to add or remove ids, but they shouldn't change anymore if you are starting to create snapshots, otherwise values will be restored for the wrong control elements. If id changes can't be omitted, please remove the .NGS file from SD Card, so that a new one will be created. Note that snapshots can be alternatively controlled from buttons or incoming MIDI events by using meta events as described in the .NGC page. The Router page allows to configure the integrated MIDI Router. See the MIDIbox OSC chapter for more details about the OSC protocol. The Network page allows to configure the Ethernet interface of the MBHP_CORE_LPC17 module. The Monitor page shows all IN ports at the upper line, and OUT ports at the lower line. The MIDI Learn function allows to assign a received MIDI event (Note/Aftertouch/CC/Program Change/PitchBender) to a controller (button/encoder/pot/motorfader). In NRPN mode it's even possible to assign an incoming NRPN event. In this learn mode, CC#6/38/98/99 will be transformed to an NRPN and can't be learned "standalone", therefore it's provided as a separate selection. which tells you that MBNG is waiting for an incoming MIDI event. Once the values have been received, just move the controller (button/encoder/pot/motorfader) to which the new event should be assigned. Please note that it's also possible to assign the MIDI Learn function to a dedicated button by using a Meta Function. The Disk page allows to store and restore a patch on SD Card of a given name. It's planned to store/restore "snapshots" from the SCS, which allow to recall controller values (resp. SysEx patches) from files stored on SD Card.